Thinking of becoming a Wisper dealer? Cycling can be a daunting prospect for many people. It can require high levels of fitness and motivation to cover even moderate distances – that’s where ebikes come in. 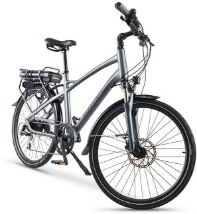 Whether you’re looking to enjoy cycling for the first time, or are a former cyclist who has been a long time out of the saddle, ebikes provide a simple no fuss option of getting from A to B.
Ebikes can be ridden and enjoyed by any-one aged fourteen and over! Customers come from all walks of life and have wildly differing motivations for purchasing an ebike. Whether you want to ditch the car because you’re fed up with being stuck in traffic, want a greener form of transport, or to be able to cycle longer distances and enjoy your surroundings then a Wisper bike can definitely meet your needs and many more. Why do Wisper only sell through Wisper dealers? We strongly believe that all electric bikes should be supplied and maintained by a professional ebike dealer as local to you, the rider as possible. Our expert dealers will offer you the opportunity to test ride your chosen Wisper and are able to give expert advice regarding the best bike to suit your needs. 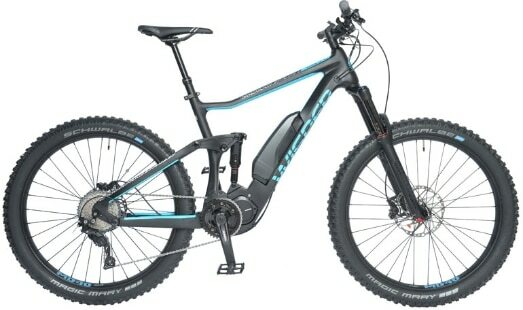 Ebikes, like any motor vehicle, need regular servicing. The best people to look after your Wisper ebike are those who supplied the bike to you. Should you ever have any issues or questions, they are at hand to look after you. For the reasons above we only supply Wisper bikes through our approved dealers. Our expert dealers are qualified to service and maintain your Wisper for years to come, ensuring you a prefect riding experience and maintaining the value of your investment. 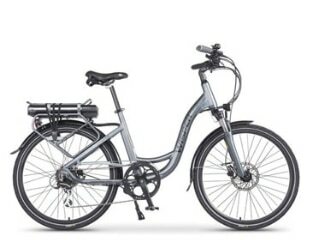 All our city and trekking bikes have all been upgraded from the old fashioned “Seat Post Batteries” to the latest “Rear Rack Batteries” as specified by all the larger manufacturers. The “Seat Post Battery” was perfect several years ago when a large volume was needed to carry enough of the older, heavier, more inefficient cells to power an electric bike. 1. They substantially extend the bike’s wheel base making storage more difficult on bike racks and in motorhomes etc. 2. 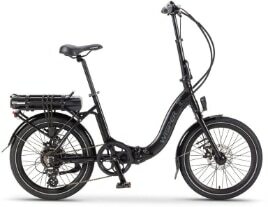 The extra long wheel base makes the bicycle bike less nimble and more difficult to control. 3. The connectors are very near to the ground and can be shorted out in the wet cutting power to your bike. With modern, light weight, high efficient battery cells we are able to reduce the weight and increase the power available in a battery. Our latest battery choice is 700Wh (20Ah). The weight placed on the rack over the rear wheel enhances rear wheel grip and bike control. Our racks have been designed to safely and securly carry your battery and still have the facility to add panniers, completely hiding the battery. 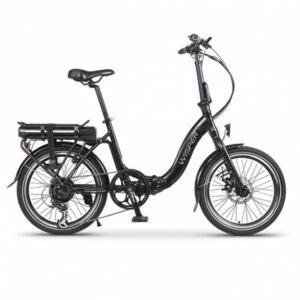 Batteries: Wisper ebikes come with the choice of three batteries that fit all City and Trekking models without the need for any changes or adjustments to the bikes or batteries. Both battery options are provided with a two-year warranty. Our batteries are stowed in a specially developed rear rack shortening the wheel base, resulting in a safer, more nimble ride and raising the battery away from road spray. A short wheel base ensures improved safety and control, especially at speed. 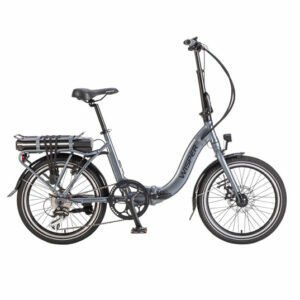 Battery Option 1: Standard 375Wh lithium battery has a range of up to 50 miles and takes 2.5 – 5 hours to charge. Battery Option 2: Long range 575Wh lithium battery has a range of up to 75 miles and takes 2 – 4 hours to charge. Battery Option 3: Mega range 700Wh cutting edge LG battery with deep sleep mode, has a range of up to 90 miles and takes 2.5 – 5 hours to charge. Controller: The controllers found on both Wisper ranges run on our own patented software. We have developed the software to offer the most natural of riding experiences. When combined with the Wisper cadence and torque sensors we are able to produce the smoothest, most responsive ebikes on the market – regardless of cost. Motor: Both Wisper SE and Wisper Torque bikes are driven by the latest brushless motors made by one of the largest ebike motor manufacturers in the world. The Wisper Torque’s ultra high torque brushless motor is extremely compact and very powerful. When used in conjunction with Wisper’s unique software the Wisper Torque’s motor is virtually silent. the trails as it comes with all the latest technology available.